Uche Umez: Let's Call it, Say, Literary Africana! OK, call it whatever you want...say, Literary Africana! But anyhow, I’ll be featuring (with the kind permission of the authors – oh, I know, well, you sometimes can’t escape the easy magnet of clichés) between now and who-knows-when the excerpts of some fiction by a few authors – mostly Africans, of course – whose writing I strongly admire. By this, I’m hoping some of us aspiring writers can draw inspiration and some courage from them, as we strive to find a foothold in the steep uphill climb that is creative writing. Lest I forget, I was privileged to see a few of these works in their raw artless foetal form, before, you know, the works finally came out polished as gem, and hit the bookstands. Nuvoyo's writing is so crisp, so understated in its narration, you're stunned by its sharpness. Enjoy! WE ARE IN THE SUBURBS, at the Nleyas, where Mama works as their domestic. I have fallen in love for the first time, with the Nleyas’ daughter Asanda; she is the prettiest thing I have ever seen. Creamy skin and long hair which her Mama straightens with a hot comb, and huge round eyes she likes to bat like Darla in ‘Little Rascals’. I watch her for days and I cannot speak. ‘I’m not supposed to speak to the staff,’ she says in her white accent. ‘Well,’ say I. ‘I ain’t the staff.’ I am trying to affect an American accent and it’s going terribly. It is the first time I feel anything like shame for who I am, who Mama is, who she makes me. ‘She ain’t my mother,’ I lie. Tears well up in my eyes. I have been trying to impress this girl and now she is making a fool of me. I have never taken the time to really look at myself. But it is true; next to Asanda’s creamy skin, I am like a little block of coal. My front teeth overlap. My nose is tiny and my lips fat. But it is better than her big flat nose, I decide. She may act white, and look almost white, but that nose is undeniably black. It is the first time I come close to anything like self-loathing. My crush on Asanda quickly turns to spite. She is pretty, she is rich, she is spoilt and, worst of all, she humiliates Mama every chance she gets. ‘What is biology?’ Asanda asks Mama one day. ‘Go ahead, tell her, I heard her saying it, she was discussing maids with Mrs. I take a step forward. ‘Don’t you speak to my mama like that!’ I screech. I wish I could strangle the brat. I despise Mama for not being able to speak up. At that moment, I learn just how close humility is to humiliation. Shadows is available to order on Amazon, Foyles, and Word-Power. Keep checking the site for availability in bookshops and other stores, links to reviews, etc. 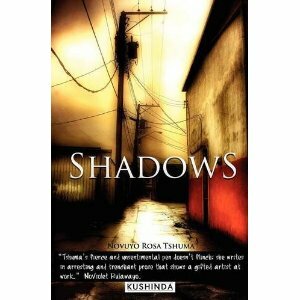 Follow Shadows on the facebook page Shadows – Novuyo Rosa Tshuma to keep abreast of all the latest news about the work.